One of the questions we're most frequently asked by relatively inexperienced gardeners is, “How do I know when to harvest that lettuce?" (Or carrots, or spinach, or . . .) While some types of vegetables may be pretty obvious (ripe red tomatoes, for example), others tend not to be, particularly for inexperienced gardeners. Carrots, beets, kale, lettuce, peas — these can be a little trickier to understand. What follows is a brief harvest how-to for some common spring and early-summer vegetables. You’ve been diligent about keeping cabbage worms off your plants, and now you finally have a perfect head of broccoli — but it’s only four inches across. Is it ready to harvest? Or should you wait? Broccoli can be tricky, because people expect to see heads as large as those in the supermarket. Recognize that commercially grown broccoli will likely be larger then your own, and that often those huge heads are actually several smaller heads tied together (hence the thick rubber bands). Non-organic broccoli may be particularly large because of its steady diet of synthetic fertilizers. A head of broccoli is really a cluster of many tiny flower buds. If left alone, it will bloom into tall yellow flowers that are pretty but not particularly edible. Regardless of the size of each head in your garden, harvest your broccoli when the tiny tight flower buds start looking looser and swollen, but before they open up and separate. Cut the head a few inches down the stem, leaving the rest of the plant in the ground. It will continue to form small bonus side shoots over the next several weeks. When that production slows down or you need space for other plants, go ahead and pull out the entire plant. Until this year, we had always harvested Swiss chard by cutting off the outer leaves and stems (up to about 25 percent of each plant) and then letting the plant recover. This year at our Sunderland Farm garden, we experimented with a different technique: cutting the entire plant down to about three inches from the ground, as shown in the top photo. The colorful stubs that were left rebounded with amazing speed. The second photo shows the same bed one week later. The next week, we were able to harvest select leaves. A week after that, we did another full cutting of the entire plants, filling three large milk crates with harvest from a single 4-foot-by-10-foot bed. We’re waiting to see how long we can get away with this over the summer. Besides producing a larger harvest at one time, the advantages we see are that the plants seem less inclined to bolt and are less prone to damage from leaf miners (most likely because we’re completely removing their food source for a period of time). Kale can be harvested leaf by leaf as the plant matures. As with many vegetables, if you continue cutting at a reasonable rate, the plant will continue throwing out new leaves for weeks on end. Root crops are easy to grow and are particularly successful in the friable soil of raised beds. 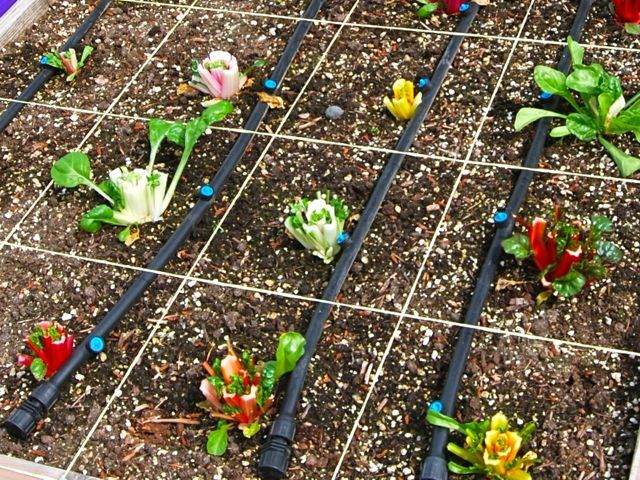 With the exception of radishes, though, they take a long time to grow, and people start to get anxious about how soon they can expect to harvest. And while the seed packet may state a maturity date of 54 days for beets, anyone who has ever grown them knows that’s usually optimistic at best. Fortunately, most root crops have telltale signs of readiness: they tend to pop up out of the ground as they mature. Take a look at these photos of mature radishes and beets. Except for the smaller beet in the background, they’re all up above ground now, making it much easier to see their size. Radishes like the D’Avignon variety shown here are the most dramatic. Carrots may do this as well, but to a lesser degree, so sometimes you’ll need to brush soil away from the top of the carrot to see how large it is. Or just go ahead and pull one, and then wait on the others if you feel it’s a little too small. Even when fully mature, carrots will hold in the soil for nearly a month before they start to split. Note that exposed carrots turn from orange to green in sunlight, so you can pile up a little more soil to cover the tops of not-quite-ready carrots as a preventative measure. A few more specific pointers on root crops: beet leaves are delicious and can be harvested (judiciously) as the roots mature. Pull off a few every now and then from each plant, but not too many, as they’re needed to feed the beet roots. And be sure to remove and discard any leaves infested with leaf miners, easily identified by squiggly tan-colored trails and ugly blotches on beet and chard leaves. This is one plant that can give you great latitude, depending upon variety and how you space it. 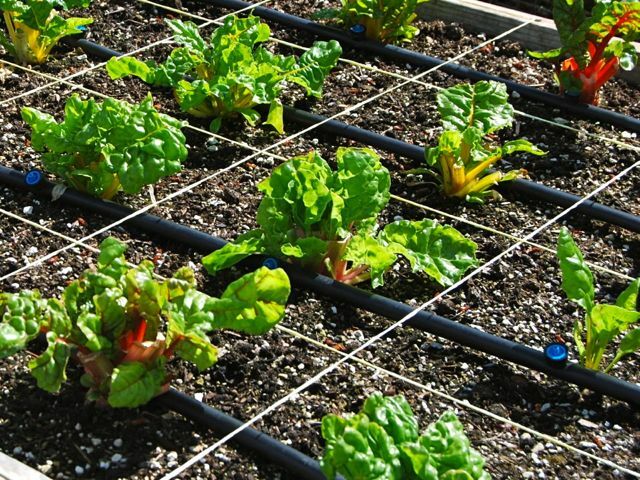 Thickly sown as part of a mesclun or baby-lettuce mix, lettuce is harvested by cutting the entire patch of plants down to nearly soil level when they’re only about three inches high. 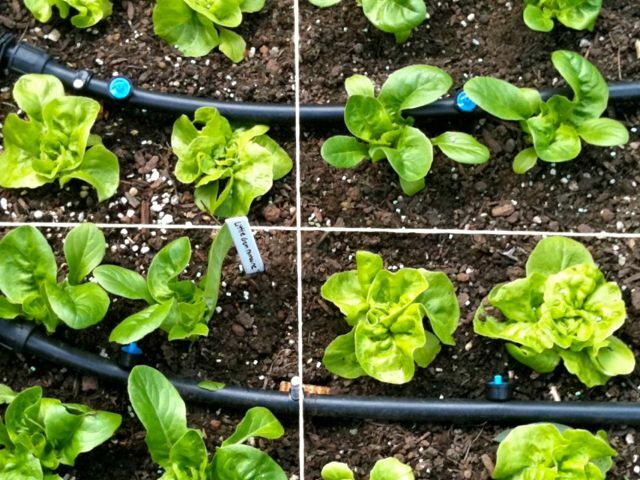 Planted more conventionally, lettuce can mature until it’s close to 12 inches in diameter, depending upon the variety. The only hard and fast rule with lettuce is to not let it bolt or go to seed. 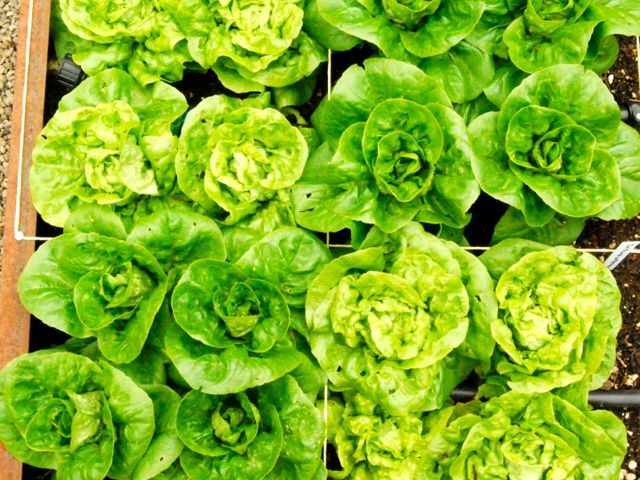 When lettuce has become too mature — or becomes stressed by heat or other factors — it will start to grow quite tall and conical in shape, and will eventually flower. Once lettuce starts to bolt, it becomes bitter and, to most palates, inedible. Pull it out and replace it if this happens. In a square-foot garden, it’s easy to see when to harvest lettuce, as shown below. The young Little Gem and Tennis Ball lettuces on the left aren’t ready yet, but when they start to crowd each other, as on the right, you can start pulling them. There are two ways to harvest lettuce. Butter lettuces such as Tennis Ball and other head lettuces are best harvested by cutting off the entire head, then pulling out and composting the roots. This is because the heads are so tightly packed that it’s difficult to pull off individual leaves. With leaf lettuce such as romaine, though, you can harvest outer leaves, just as you do with kale. Take no more than about 25 percent of the leaves, and the plant will continue to produce. After you’ve harvested this way for several weeks — or when you need the space for another crop — you can pull out the entire plant. We’ve found that snow peas are best harvested while they’re still quite flat. They get tough if the immature peas inside the pods grow too large. I usually tell people to harvest edible-podded sugar snap peas when the pods are about the size and thickness of an adult’s pinky finger. With shelling peas, though, it might pay to pull one or two pods off of the vine and zip them open to inspect. They should be harvested when the peas inside the pod are full and round, but before they start to crowd each other. Once they get crowded, they become starchy and less sweet. It’s best to harvest peas using two hands, one to hold the vine and the other to pull the pod off the vine. We’ve seen too many people accidentally uproot an entire plant when trying to harvest one-handed. And although this is true of most vegetables, it’s particularly true for peas: for maximum sweetness (and nutritional value), try to pick them right before you plan to cook them. Those sugars start converting to starch as soon as the pods are picked.